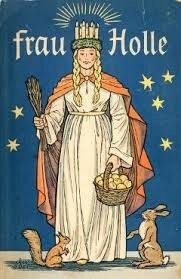 Frau Holle is a Germanic/Scandinavian Goddess, who is celebrated at the Winter Solstice. The wonderful Maria Gimbutas believes that Frau Holle pre-dates most of the Scandinavian pantheocon. It is said that Holle lives in a cave nestled in the mountains or at the bottom of a deep well. She is Maiden. She is Mother. She is Crone. As an Earth Goddess, she represents fertility and growth, as well as being the feminine spirit of the woods and plants. Her special plants are in the evergreen family, such as mistletoe and holly. Her tree is the Elder, which is called “the medicine of the common people”, for all the herbal remedies which come from the Elder Tree. Holle is identified as one of the Protectress of Witches. She is a leader of women and the female nocturnal spirits of these women, who would leave their bodies to ride with Holle throughout the skies. She is the mother of small creatures and the souls of dead children. She is also a Lady of Hearth and Home, and the Queen of the Hunt. She is sometimes seen as a beautiful, shining, young woman and at others, the old hag, riding her broom. 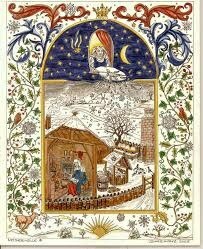 With Her feast day being held on the Winter Solstice, she is viewed as the Queen of Winter. There are processions throughout the streets, where women are masked to look like Her. At night, She rides her broom, wearing a red cloak, filling children’s shoes with presents. It is said Holle brings the first snowflakes of the year; as She shakes out her comforter, a gentle snow comes and covers the Earth. The sun comes out when She combs Her hair and it rains when she throws out Her laundry water. As such, She is a Goddess of the Weather. Holle is the inventor of all domestic acts, but her specialty was spinning. 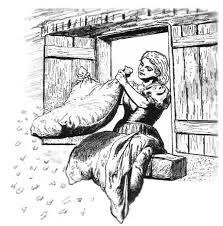 The stories tell of Frau Holle checking the spinning of everyone, and if they were diligent in their work and their spinning was good, She would reward them with gold thread; if their work was lazy, she would tangle and dirty it. She disliked laziness, and approved of good, hard work, both of which are rewarded by Her. Holle travels the world in her wagon from the Solstice through the beginning of January. It is said that once she broke a wagon wheel on her travels and a man stopped to help her. When She was once again on her way, she gave him 3 rocks and told him to put them on his window when he arrived home and he would be rewarded for his diligence and kindness. He did not believe her and grumbling, went home to follow her instructions. When he arose the next morning, the stones had turned into gold, thus she had rewarded him! Another story of her rewarding kindness and hard work is the tale of two sisters. One sister fell down a deep well, arriving in Holle’s realm. As she journeyed, she helped everyone she came in contact with, eventually finding herself at the home of Holle, where she continued to help and keep Holle’s home clean. When she returned home to her mother, she found that each time she spoke, gold would fall from her lips, and thus, she was rewarded by Holle. When the mother saw this, she threw her other daughter down the well. This daughter would help no one and offered no kindness to anyone on her journey, including Holle. When she returned home, she found, to her and her mother’s dismay, each time she spoke, toads fell from her lips. This daughter was rewarded in a different way. You will recognize Frau Holle in stories by the Brothers Grimm, as one of the names they called Her Old in their stories was Mother Frost. You can call on Frau Holle this Winter Solstice, using meditation, falling down her well, and going deep within on your own journey through her realm. What will await you? What will you be called on to do? How will you be rewarded by Holle? As always if you have any questions or comments, I can be reached at MysticalShores.wordpress.com.